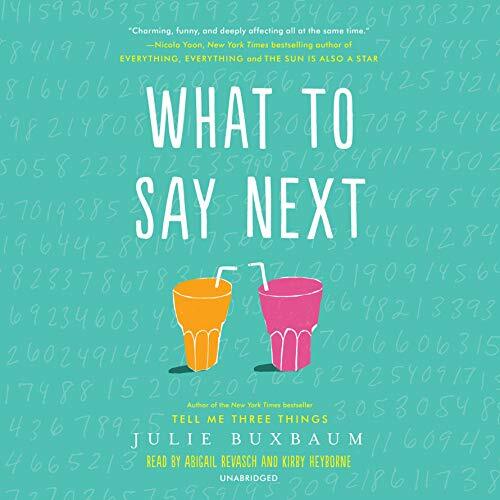 From the New York Times best-selling author of Tell Me Three Things comes a charming and poignant story about two struggling teenagers who find an unexpected connection just when they need it most. For fans of Sophie Kinsella, Jennifer Niven, and Rainbow Rowell. David: In the 622 days I've attended Mapleview High, Kit Lowell is the first person to sit at my lunch table. I mean, I've never once sat with someone until now. "So your dad is dead", I say to Kit, because this is a fact I've recently learned about her. Having a son with Aspergers, this story was especially touching and special to me. I hope there will be another book with this characters. I want to know where they go! I’ve loved this book so much. David’s point of view brought tears to my eyes, as the mother of an Autism Spectrum teenager I was seeing some of my son in David. Kit was very well written and had great character development. I highly recommend this book. "A brillantly delighful, yet astonishing captivation through an intense array of emotional expostions on all levels of the human experience. Just when you think it absolutely can not get any worst or better, it does, and with so much passion, wit, conviction and morale consciousness. I recommend this novel for anyone who has a heart, mind, or soul 100%." Couldn't Put It Down !! Lately I've run into quite a few books that have been great until the end ruins it so I was skeptical about this one. I am so glad I gave it a chance. This book and the narration done was perfect from beginning to end. Julie Buxbaum can describe so clearly that you feel like your participating. I listened to this during a long ride then sat in my car and continued to listen once i got home. I found myself laughing at some of her phrases. Great story, super authoring skills. I would like to see this as a movie. After reading tell me 3 things I was so excited to start reading this book. In the beginning it was very slow paced and kinda boring but I thought that it might get better. It never got better it was a very boring book and not at all like tell me 3 things. I was expecting a fairy tail ending but the ending left me wondering what was going on and needing to learn more. good story. I never truly felt 100% attached to the characters, but I love and appreciate that the author felt a deep connection to them and even heard their voices in her head as she created the book. Good book,well read, well played. Real life struggles, realistic life paths. includes everything. Self doubt, young love, family dynamics overcome.